Caterpillar | It’s All About the Customer, For This Caterpillar Employee And Her Team. It’s All About the Customer, For This Caterpillar Employee And Her Team. When it was time for Laura Ruiz-Santamaria to begin her job search, Caterpillar was one of her first stops at the career fair. The crowd of people surrounding the booth and strong reputation of the brand encouraged Ruiz to apply. She accepted a co-op position after graduation, and when that placement came to an end, she applied for a full-time position working in logistics. Now, after several years, she’s helping her team manufacture superior products as a Section Manager. 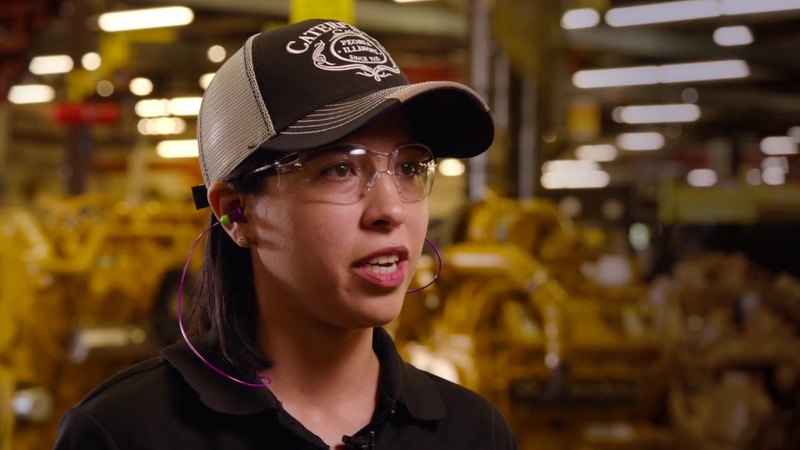 Whether it be developing new solutions, or powering up communities with new resources, Ruiz says she enjoys seeing the impact Caterpillar machines have in the field with customers. When it comes to helping customers, Ruiz says it couldn’t be done alone, and that working at Caterpillar is ultimately about a team coming together to do whatever it takes to meet a customer’s goals, whether it be on the line or in the offices. Ruiz sums up her entire Caterpillar experience in one word, success. She says having yellow blood goes beyond personal achievement, it’s all about the end result. Are you interested in beginning your career journey with Caterpillar? Join our team today!